That’s quite a beast, isn’t it? If you’ve never been to Pittsburgh you’re probably thinking I’ve finally gone Panini Delirious. But if you’re from the ‘burgh, this behemoth featuring a sirloin beef patty, Provolone cheese, french fries, cole slaw and tomatoes might remind you of a popular local favorite – the Pitts-burgher Cheese Steak at Primanti Bros. With the the Super Bowl coming up this Sunday I’m making panini in honor of each of the participating teams. Today’s is for the Pittsburgh Steelers (Cardinals fans can relax – I’ll be talking about y’all tomorrow!). It was too over-the-top to resist. It needed just a few modifications to work on a panini press. Primanti Bros. uses soft Italian bread for its sandwiches but to avoid having all those juicy toppings saturate the bread during grilling I switched to a sturdier French batard. Also, rather than grill the entire sandwich at once I pressed just the beef patty, cheese and fries first and then added in the cole slaw and tomato at the end (not unlike the McDLT of the ’80s if anyone remembers that!). A sandwich with this much stuff on it has got to be good. And it was. I was really amazed that I was able to cut this thing in half with most everything staying intact! Folks in Pittsburgh definitely don’t mess around when it comes to sandwiches. Wishing them the best of luck (and the same amount of luck to Arizona :-)) on Sunday! P.S. I’m entering today’s sandwich into The Ultimate Super Bowl Party Recipe Smackdown over at The Recipe Girl. P.P.S. You can read what my Adopt-a-Blogger “parent”, Curt of Bucky’s Barbecue and Bread, thought about the original Primanti Bros. cheese steak. Bake frozen french fries according to package directions. While fries are baking, prepare the cole slaw: In a large bowl, combine vinegar and sugar. Stir in oil. Add cabbage to dressing and season with salt and pepper. Toss to combine, adjusting seasoning as needed. Set aside in the refrigerator. Preheat the panini grill to high heat (400 degrees). 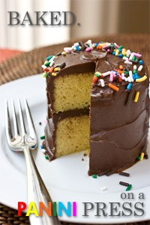 Line a jelly roll pan or cookie sheet with waxed paper. With a rolling pin, roll out meat to 1/4″ thickness, roughly in a rectangular shape. Divide into 6 rectangular burgers. Season with salt, pepper and garlic powder and carefully transfer the burgers to the grill (you will probably need to do this in two batches). Grill 3-4 minutes until cooked through. Turn off the panini grill, clean the grates, and reheat the grill to medium-high heat (375 degrees). For each sandwich, layer a burger, a slice of cheese and a handful of fries on top of a slice of bread. Top with another slice of bread and grill 4-5 minutes until cheese is melted and bread is toasted. Remove the top bread, add cole slaw and tomatoes to the sandwich. Replace the bread on top. Cut the sandwich in half, serve immediately and enjoy! Awesome idea- love it! You’re so creative getting the city in there and everything. Good luck! Oh my gosh! I just saw Primanti Bros featured on Man v. Food. The sandwiches on that episode were phenomenal. I don’t remember if the sandwich featuring fries and cole slaw was from that episode or another one, but when I saw it, I told my husband, “I’d eat that sandwich—at least 1/2 of it.” He looked at me in shock. Seriously, I love cole slaw on pulled pork BBQ sandwiches, and adding it and fries along with tomatoes and cheese to your panini’s is inspired. I’d eat this on Super Bowl Sunday (and many other days as well)! 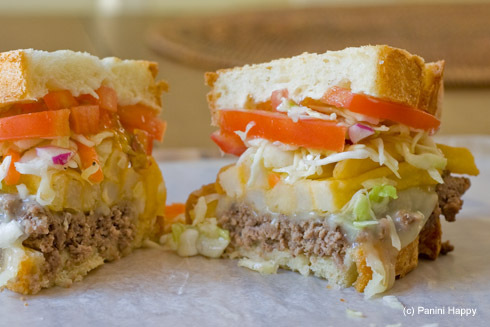 Primanti Bros puts slaw and fries on all their sandwiches….it’s wonderful! Totally love this! I think I will make this for Grumpy & I soon – I think we will both be glad I did! Looks delicious! Yay, fries on a sandwich!!! It’s one of our secret faves to put potato chips (of any kind) and/or french fries (of any kind!) on a sandwich or burger. Breakfast, lunch, dinner. So great! 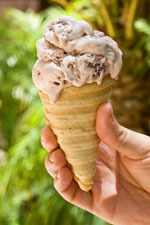 This looks like the kind of thing you need to have a big ‘ol mouth and hands for! Here we go Steelers! Here we go!!! I haven’t been to Primanti Bros. in over 13 years. Your cheese steak panini would do them proud! WOW!! This has all the foods I am craving right now!!! That looks so yummy!! I was about to say that I would add some red pepper flakes to the patty, then I read the tip about tabasco sauce. It does seem like a little zing would make it extra delicious. This looks incredible!! Fries on there too- can’t get any better than that. I don’t know who I am going for in the Super Bowl- maybe your Arizona sandwich will make the decision for me. So the best sandwich is the team I go for, OK? ooo looks really delicious! And I love fries in sandwiches! Now there’s a panini with bragging rights!! 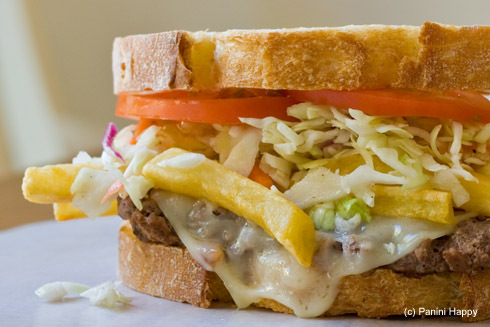 fries on a sandwich…hmm…sounds odd but looks really good! You can order a “cheesesteak with egg” at Primanti Bros. It’s their classic sandwich with a fried egg on it. It’s cooked on the same grill alongside your steak, so the juice is in the egg. Absolutely to die for! I made this with a couple substitutions- I made my coleslaw with my regular mayo recipe and vinegar- and used crusty italian bread along with Monteray Jack cheese– FABULOUS! My family wasnt sure about combining fries and coleslaw on a sandwich but kept an open mind- they LOVED it! Primanti’s is one of my favorite places! Living in Florida now so I really miss them. Can’t wait to try this panini! Mmmmmm…making me homesick for Primanti’s! !